Anaheim Elementary School District HAS MORE TO OFFER! ALL students receive an e2STEAM-D education at AESD! 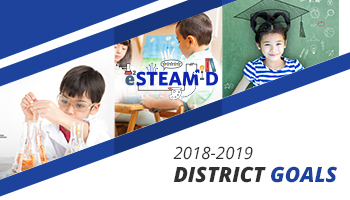 The district has made the commitment to provide students with engaging, equitable, STEAM (science, technology, engineering, art, math) and dual language immersion (DLI) learning opportunities at all 23 school sites. Beginning in the 2019-2020 school year every student at every school will have access to STEAM curriculum and the opportunity to participate in our award-winning DLI program. These best practices- which are available at some of our schools already- will make sure that all of our students are prepared to succeed in the 21st century. What does an e²STEAM-D education look like? Engaging: We put students first and focus on providing an education that engages their individual needs. Equitable: We take pride in the fact that all students at our 23 school sites have access to tools, programs, and educational opportunities that support their success. Technology: We are a 1:1 technology district, which means that each student has access to their own high-quality technology device (Chromebook, Chromebox, or iPad) and receives integrated technology instruction every day. Plus, students learn coding and can compete in our district’s annual coding competition. Coming soon: we will be offering the first eSports elementary curriculum in the COUNTRY. Engineering: Students K-6th grade receive lessons in engineering design through engaging project-based curriculum such as Project Lead The Way. Arts: We offer an award-winning music education program beginning in transitional kindergarten. Students in 5th-6th grade can learn up to 6 instruments and we provide the instruments. Math: Students learn critical thinking and problem solving in K-6th through engaging curriculum such as the popular ST Math program. Dual Language Immersion: Beginning in the 2019-2020 school year, opportunities for students to become bilingual and biliterate will be available at our 23 school sites. Offerings will include our award-winning Spanish program, and Korean at Jefferson Elementary School which will be the only KDLI program in Orange County.